The deadline to enter the 30th annual Fall Art Show and Sale is 4 p.m., Friday, September 13th. There’s still time to return your completed form to Oliver Community Arts Council but hurry! Enter in any one of the 8 categories: Watercolour paintings, acrylic paintings, oil paintings, fibre art, 3-dimensional, photography, other media, or emerging artist under age 18. Entry forms can be downloaded here. This year’s show is Saturday, October 5th and Sunday, October 6th. Saturday is free and open to all visitors from 3 -9. You receive a ballot and are asked to vote your favorites in each category. That evening the votes are tallied and winners awarded prizes during the opening reception from 7 – 9 pm. Sunday’s admission is only through a Festival of the Grape ticket. 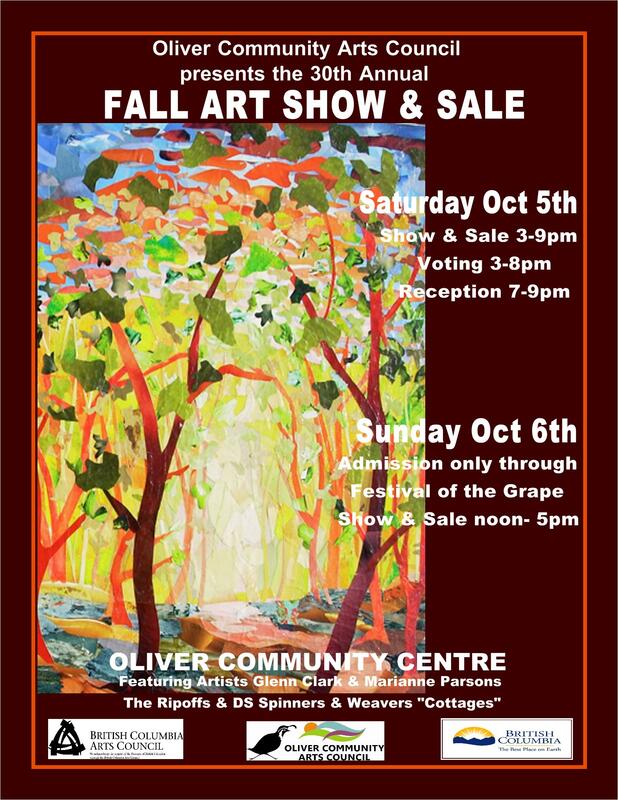 All the artwork entered in the show is for sale. You’ll also want to take a look at the silent auction offerings. your good used, new, items of interest for the silent auction. Email Bernice Myllyniemi at phone 250-498-3679. We’ll make arrangements to pick up.